This “post” is a personal report of my recent attendance at the International School Sport Federation (ISF) General Assembly. The official minutes of the meeting will become available in the coming months. I had been looking forward to my to Besançon in the Franche Comte region of France for sometime. 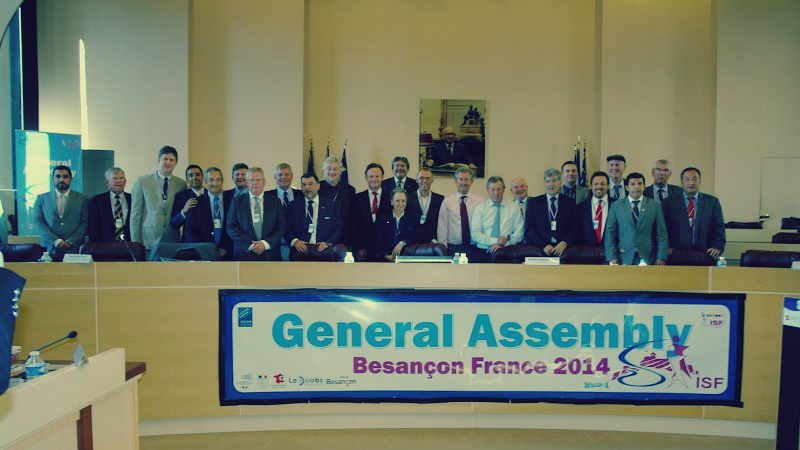 The occasion was the biannual General Assembly of the International School Sport Federation (ISF). This meeting is open for all member countries (72) to attend and facilitates the biannual collection of the executive and office bearers of the ISF. I have been a member of the ISF executive for two years and was standing for election again at the General Assembly. Besançon is located immediately to the north of the Jura region and close to the Swiss border and is famous for its food and wine, its countryside, and indeed its culture and history. It was interesting for me to learn that it is a part of France not often visited by us English-speaking people. 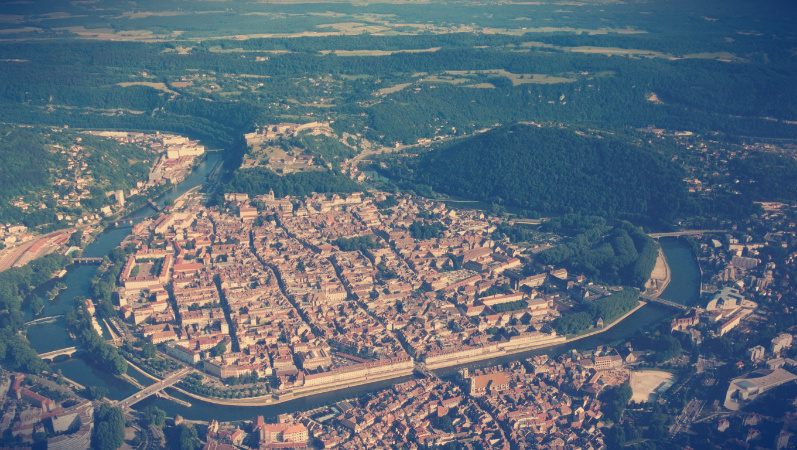 Besançon has a population of 118,000 people and is seen as the greenest city in France. I was also to learn of the significance of the local regional UNSS (National Union of Schools Sports) organisation. One out of every four school students in Besançon are participating in school sport; last year 212 medals were won in the French National School Championships by students from the region! Travel to the General Assembly was very easy for me. I flew directly from Edinburgh to Basel. I was met at the airport by Teddy a former director of the regional UNSS organisation. During the 1 1/2 hour journey on the autoroute to Besançon. Teddy delighted me with his enthusiasm for school sport and for wine and whisky! Mind you, circumstances required me to use my schoolboy French to communicate! The first formal meeting of the ISF executive committee was held the next day. The agenda was spread over two sessions morning and afternoon. Much of the morning session was spent on reports of the Gymnasiade which had been held in December 2013 in Brasilia and the associated executive committee meeting which was staged of course in Brasilia. We also have had reports from each member of the management committee, and short reports from each of the Continental vice presidents. From my perspective developing these stronger links with the world sports federations is to be welcomed. With close cooperation, the quality of ISF events should continue to improve. But of course we need to be a little cautious and the worldly-wise in our dealings with the governing sports federations. We need to continue to ensure the education dimensions of ISF’s work and operations shine through in practice. We also need to be aware that not all sports organisations are democratically organised, or transparent in the governance. We heard also that it is likely that the ISF will be invited to join the consultative committee in developing the enlarged partial agreement on sport for the Council of Europe. The executive spend some time considering the modification of statutes in their final draft. In effect, the majority of the changes had been put forward two years ago but there had not been sufficient present at the General assembly to confirm the changes. The general requirements for staging ISF events final draft was approved. The new requirements attempt to balance the need to you to involve and strengthen the local organisation in conjunction with the specific sport technical commission. Marketing and communication were again major items on the agenda. The ERAS report on the ISF marketing and communication – has now been completed. A new four-year sponsorship with Ferrara has just commenced. This sponsorship is worth €240,000. All ISF events in the future will be required to ensure that the marketing and communications mention of the event are taken seriously. It was particularly encouraging to hear of the success in staging the sample ISF events during 2014. In each of the 10 events held participation numbers and the quality were amazing and very significantly improved from previous numbers. The very first ISF school sport educational games in Athens had few participants because of the time that was given to participating countries. But we learned it is the intention of the Greek authorities to stage this event on an annual or biannual basis. The very last part of the Executive meeting focused on the preparation for the general assembly meeting itself being held on the Friday. We considered for, example of the suspension of three countries, the admittance of three countries, and the continental meetings that were to be held immediately before the General Assembly itself. During this particular ISF general assembly culture played a very significant dimension of affairs. All delegates were treated to magnificent meals in a range of locations throughout the week. And of course being France we were treated to a fabulous selection of local wines. Delegates also enjoyed visits to the time clock Museum and to the citadel of Besançon. On the cultural day we were all taken by bus to the fabulous Saline d’Arc et Senans. Constructed for salt production, this is an amazing and fabulous establishment and proved to be very active venue for everyone to enjoy. Of course being in France any cultural day would not be complete unless we had an opportunity to visit a vineyard. We were not disappointed. The vineyard of Jacques Tissot Chais Les Bruyeres near Arbois proved to be a real hit for us all! In my own case I always try to swim in the local swimming pool. I was so pleased to find a marvellous outdoor pool about 800m from the hotel belonging to the local multi-sports club. Sadly, I could only manage the time for one visit during the week. The gala dinner is held in the Citadel itself. Actors dressed in period costume provided entertainment from our arrival to departure. The UNSS Besançon regional staff proved to be marvellous hosts, facilitating the meetings, accommodation, and importantly ensuring we enjoyed all these various cultural opportunities spread throughout the week. For me year it was also useful to discuss with our French colleagues how they were organising school sport at a local level. 45 countries where represented at the European meeting. The meeting took the form of an initial presentation from Nikos Megalmos (Cyprus) and the European continental president. Nikos outlined some practical ideas to take forward following the general assembly meeting itself. In essence it was to identify 2/3 priorities that through consensus were agreed as target objectives to be piloted over the next 2 years for the European countries.This would be led by a European member of the about to be elected Executive committee. Each country would be invited to list possible topics. Good Practice of a School Sport Management – sharing ideas/ practices. Transparency in the governance of sport. Issues related to the ongoing establishment of sport schools in Europe. Laurent Petranka (France), suggested it would be helpful to have a European network to exchange ideas. He mentioned , in this connection, that at the time of the ISF Football to be held in Lille/Lens in May/June there would be an additional Educational Programme. This would focus on young referees, reporters, organisers, translators. There would also focus on athletes with a disability. French schools and teams would be involved too. Participants in this educational programme would participate in the Opening and Closing ceremonies. There is also to be an associated European Football Forum, to discuss various football projects from throughout Europe. In addition there was an opportunity for those of us who was standing for election at the general assembly to present themselves to their European colleagues. 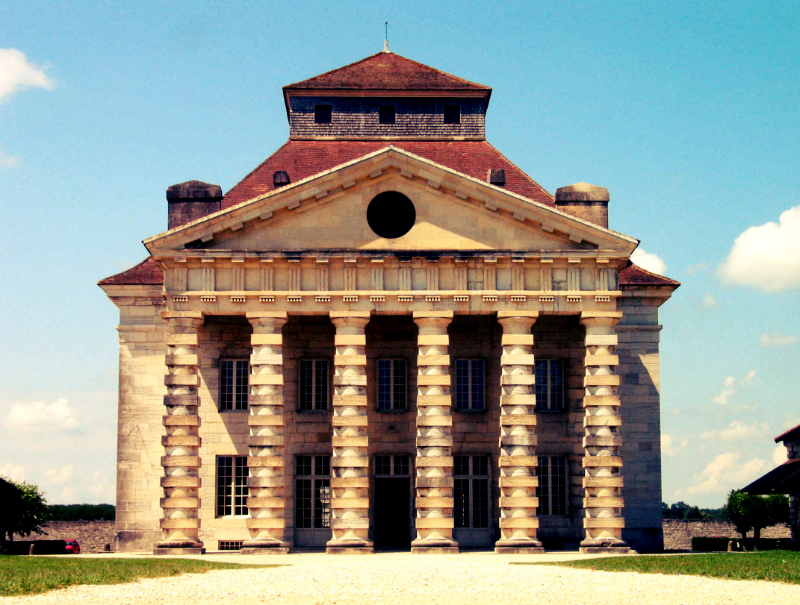 This was held at the very grand Regional General Conseil debating chamber. Following a number of formal welcomes to the meeting from the mayor, from the a Director of Sport and the Director of Education, the meeting was also addressed by Vlad Marienescu, Director General of Sport Accord. His presentation centred around a short video entitled ‘I am an Athlete’. 51 member countries were present at the meeting. Italy offered to host both an Executive meeting and Technical commission meetings for Orienteering and Skiing. This offer was made in connection with the disappointing news that the Italian government had not allowed ISF president Andrea Delpin to continue in this role. Then followed a succession of Reports from the President Andrea Delpin, Secretary General Jan Coolen, the Vice President and the a Continental President, followed by reports from the Executive a director and the Marketing and Communications Director. Both the President and General secretary had previously circulated detailed written reports. Most of the other verbal reports were succinct. One was not short. With time so limited I think we need to agree maximum times for such reports, AND a need to circulate reports ahead of the General Assembly AND not taking up GA time with matters pertinent only to a continent. The Finance reports and accounts,and Auditors Report were also presented and approved. There will no no change in the affiliation fees to the ISF. The changes to the Statutes and rules of a Procedures, as discussed in the Executive meeting were also approved. The calendar was outlined – this again had been discussed and venues agreed in the Executive meeting. Please see the ISF calendar on the website. Immediately ahead of the election of the Committee, Laurent Petranka ( France, President Elect) outlined his idea of staging a special meeting during 2015 for all member countries to discuss a Vision for the ISF. The competitive election of the Executive committee followed. The final list of post holders and committee members can be seen on the ISF website. The new President is Laurent Petranka (France – director of the UNSS), the new Vice President is Nikos (Cyprus). The other members, including continental presidents can be seen on the website. I am very pleased to have been elected to a further two years as an ISF Executive committee member. But I also feel I should comment about the election procedures. Most obviously , it is a concern that no women was put forward for election.It was obvious that there was a mixture of lobbying and even perhaps some manipulation. Whilst I understand in a democracy, there will always be some lobbying. But manipulation to ensure a good representation from particular continents and also perhaps to make it easier to stage ISF meetings or events. As someone who is on record about the need for transparency of governance of sport, I am very uncomfortable about this. I intend to put this on the agenda of the new Executive. We could also be advised to consider the issues of gifts to delegates from member countries. I will draw the attention of my colleagues to the good governance tools which have recently been developed by Play The Game and other sports organisations concerned with integrity and ethics in sport. There was a very emotional thanks expressed to the outgoing President Andrea Delpin, and the Vice President Reingard Anewanter (Austria). Following a short and warm welcome from the Deputy Chief Executive of the Franche Comte Regional Council , the new Executive were addressed by the new ISF President. Laurent Petranka presented a paper, arguing that we should feel grateful for such a strong leadership of Andrea Delpin, which had been built on three main pillars , viz. Laurent argued that we need to sustain the condition of good school sport events, develop and encourage women and men within the ISF; improve school sports diplomacy; and develop ISF links (IOC , Sport Accord and world sports bodies). He continued by expressing his wish to modernise the ISF, by taking time through a special convention to discuss new directions. This meeting will be held in March 2015, possibly in Qatar. One thought he mentioned is to reconsider the costs associated with staging events. In particular to review the delegate (not the student/pupil cost currently of 44 Euros) costs. Following the proposed convention , the General Assembly would be asked to approve a Strategic Plan in 2016. The various ISF observers for each ISF event over the two years were appointed. It was discussed that a new a Health Advisory Board would be appointed. This board would have the potential to co-opt from out with the Executive committee. The Board would lead on the new drug testing regime that would come into being during the 2016 Gymnasiade. The Executive voted on the membership of a Technical Commissions. In General the advice of the specific sport technical commission chair. It became clear that with few exceptions, those wishing to be appointed to technical commissions need to demonstrate their suitability, with experience, qualifications and indeed language skills required. There is a need to resolve the cost issues associated with managing the ISF website on a daily basis. Currently a problem, as it is felt up to £20000 pa is required. Perhaps a sponsor/partner is required? The next Executive meeting is likely to be held over a period of 5 days and in Rome, in October/ November this year.